On the last 23rd of November, our friend Helio Catalán could work with Grégoire. 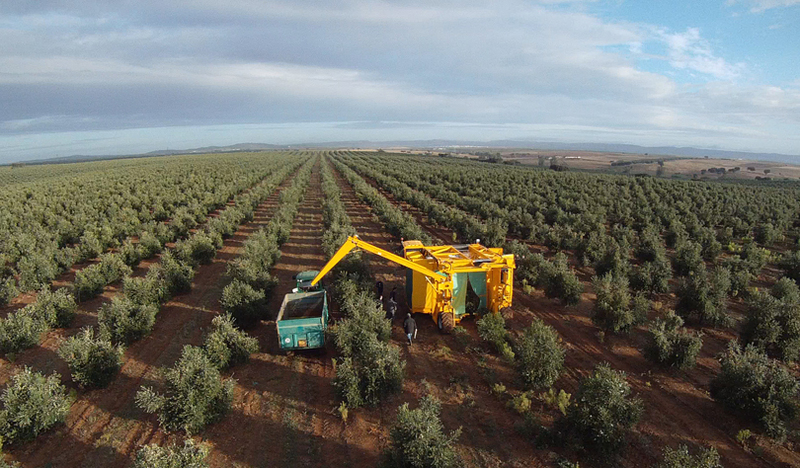 He was analyzing the job of a super machinery in Écija (Sevilla - Spain), the olive harvester G10.380 (which was launched in Fima 2012). The experience was extraordinary. Grégoire was founded in 1972 and since that moment it was specialized in grapes havesters. 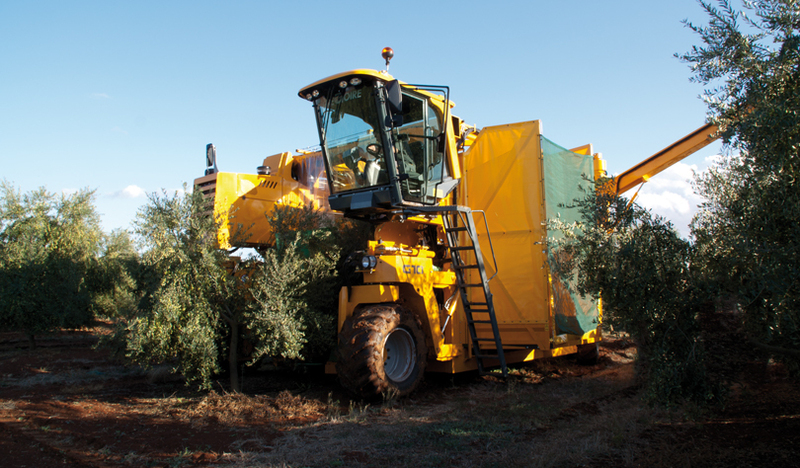 The evolutions of its machineries have been focused on olive trees and the G10.380 achieves an important milestone for the evolution of mechanized olive harvesting. 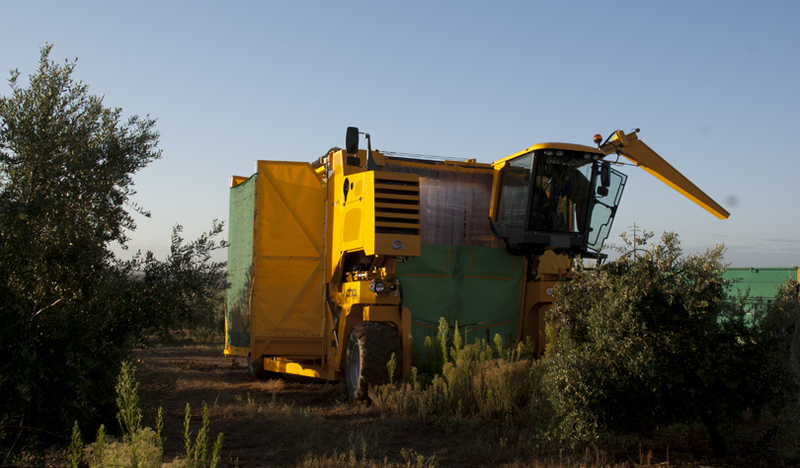 The olive harvesting is the most expensive job, so G10.380 solves this problem. It highlights for its maximum productivity, minimal losses and easy and well-done job. 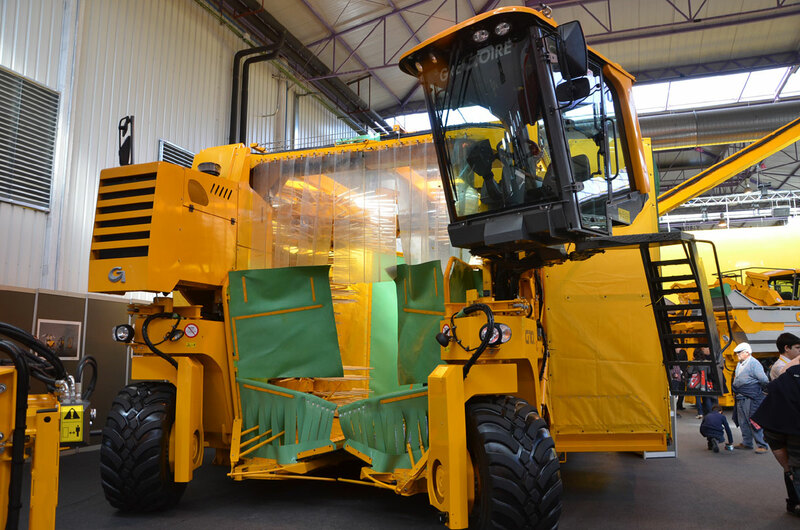 The G10 main key is its harvesting head design and its automatic steering system. 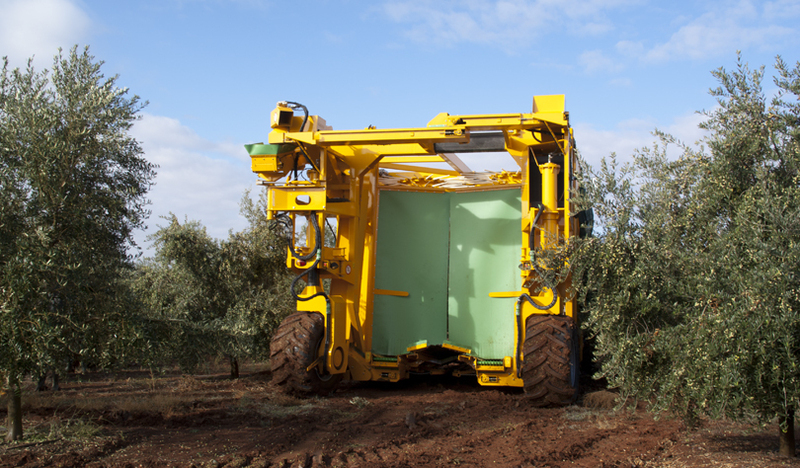 There are three innovative features in this kind of machinery: four wheel drive, mobile cabin and automatic alignment with the olive. The G10.380 is a really bulky machine. 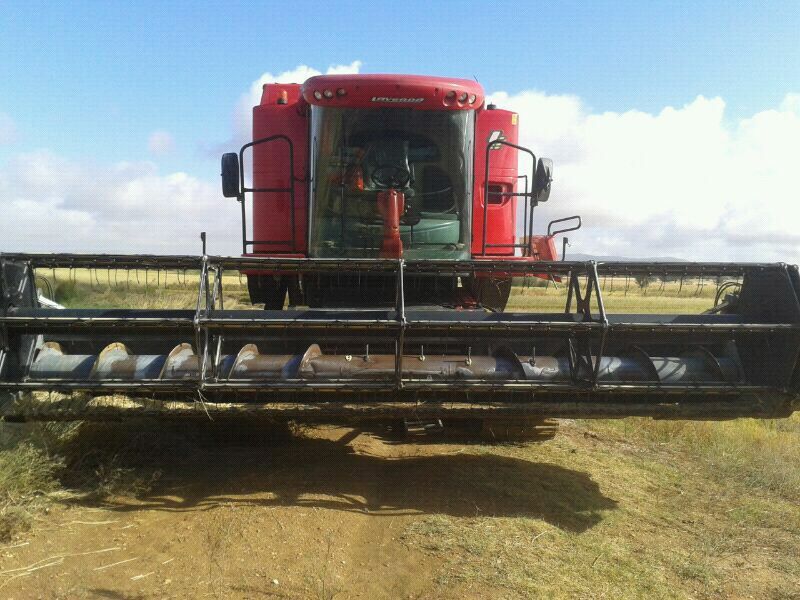 Its weight is about 23,000kg and it is due to its frame and the harvesting head. 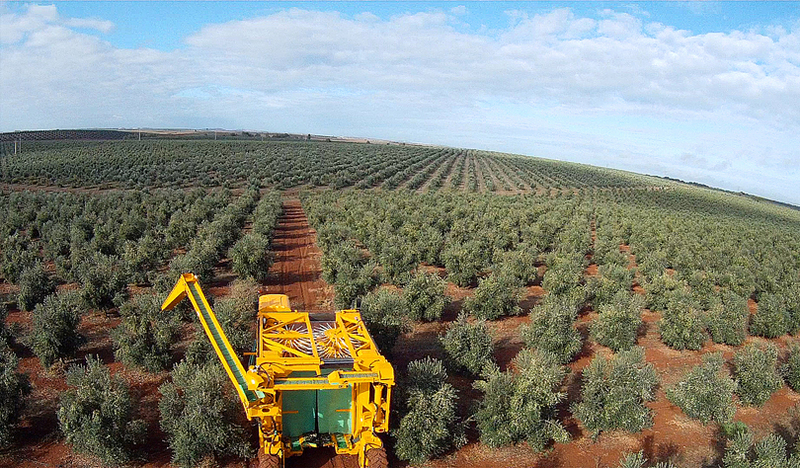 That head is composed of 8 independent rotors which can adapt the shape of olives perfectly. 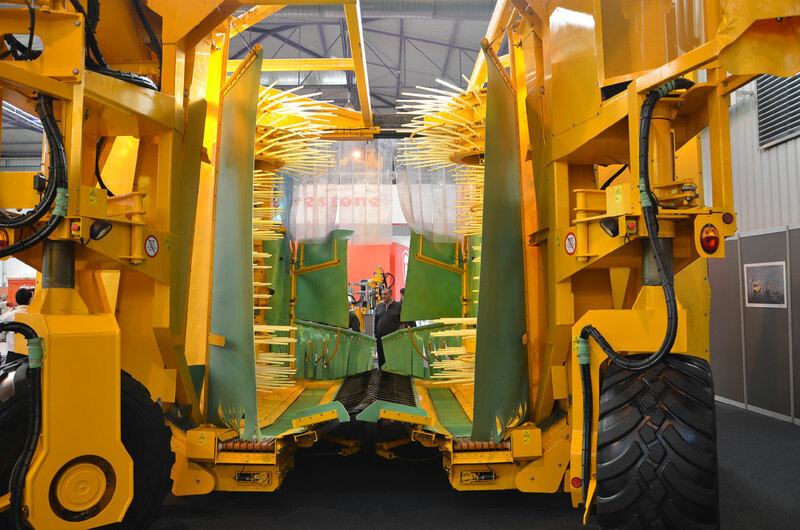 The automatic alignment allows drivers to focus on other operating parameters, engine (it is a Deutz of 205HP), unloading arm (not hoppers),... the G10.380 aligns continuously without breaks thanks to a sensors system. 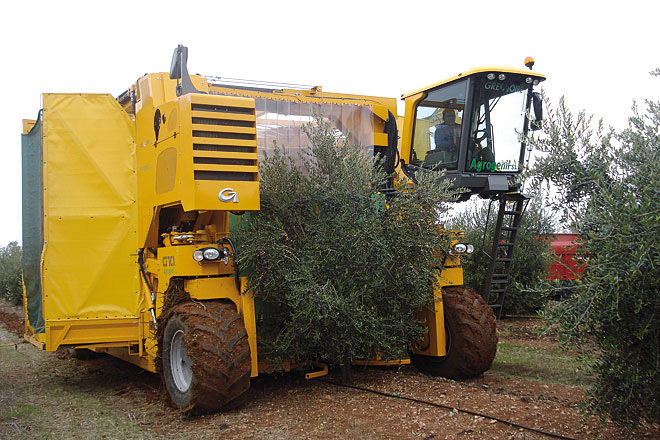 This machinery has been created for intensive olive (6*4, 6*5, 7*4, 7*5… to tree density between 285 and 400 tree/ha). 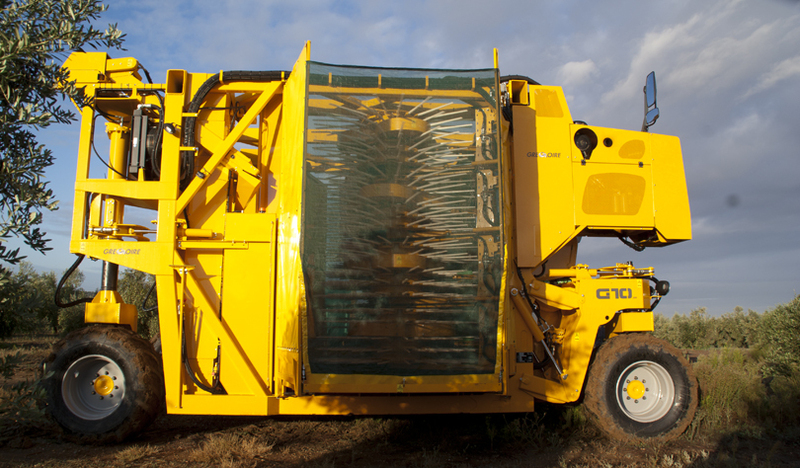 We hope to see it soon in "La Mancha" and we hope Grégoire invites us to see it for next testing exhibitions. 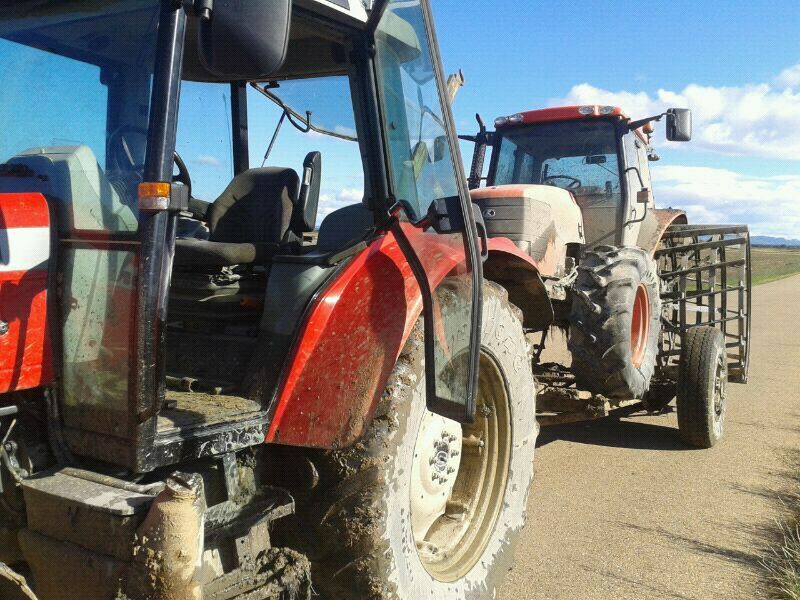 Some weeks ago, our friend Antonio Rincón Almodóvar (from Orellana la Vieja, Badajoz - Spain) sent us a few pictures about his rice jobs after harvesting. 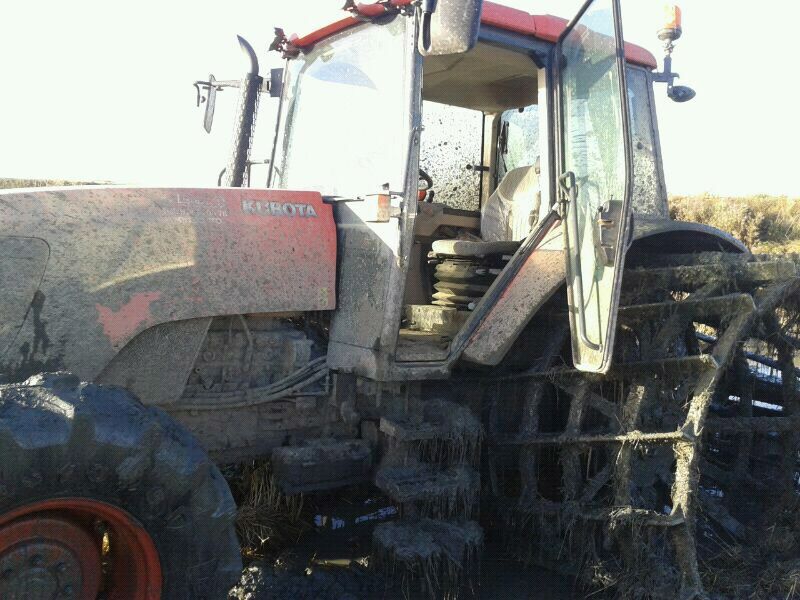 As he told by phone, the main aim is mixing straw and mud for straw rotting. 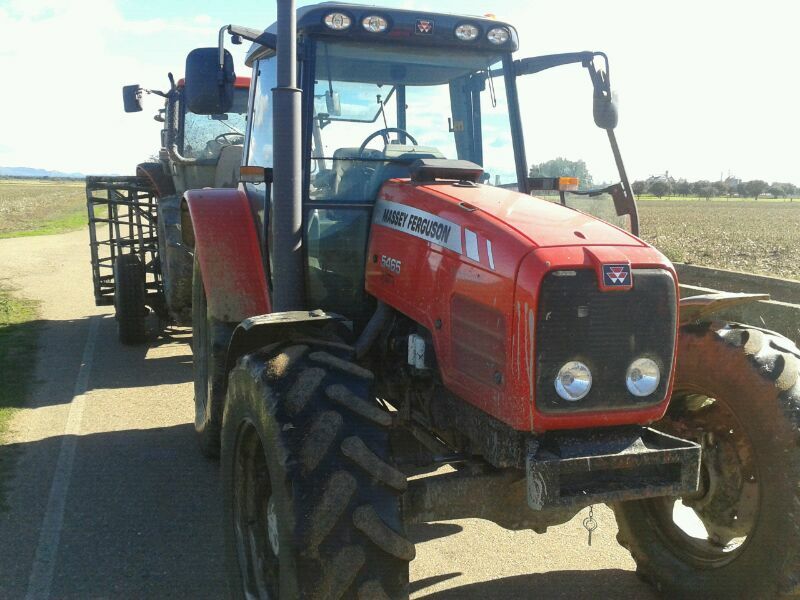 The best option for it is using a special iron wheel like a cage roller which are installed in the tractor and a cage roller hooked on its rear linkage. 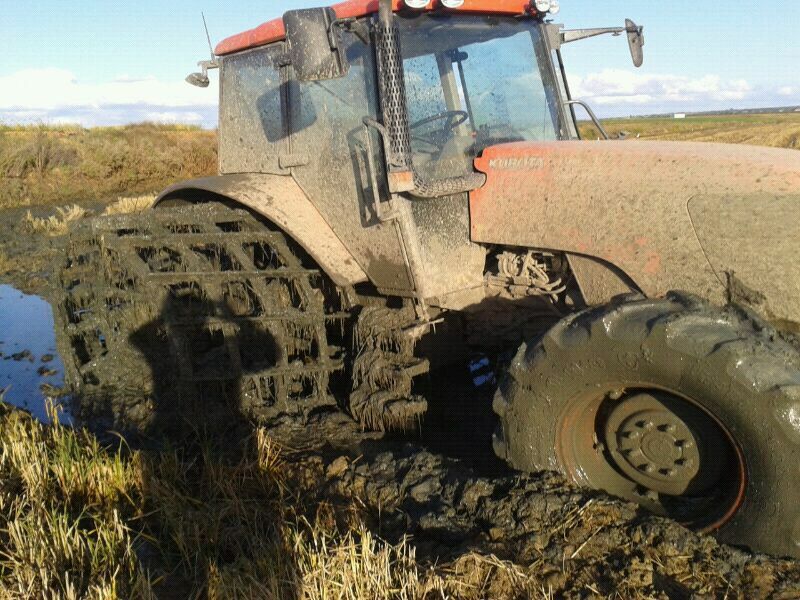 As you can see in a picture, the stubble is absolutely mixed with mud. 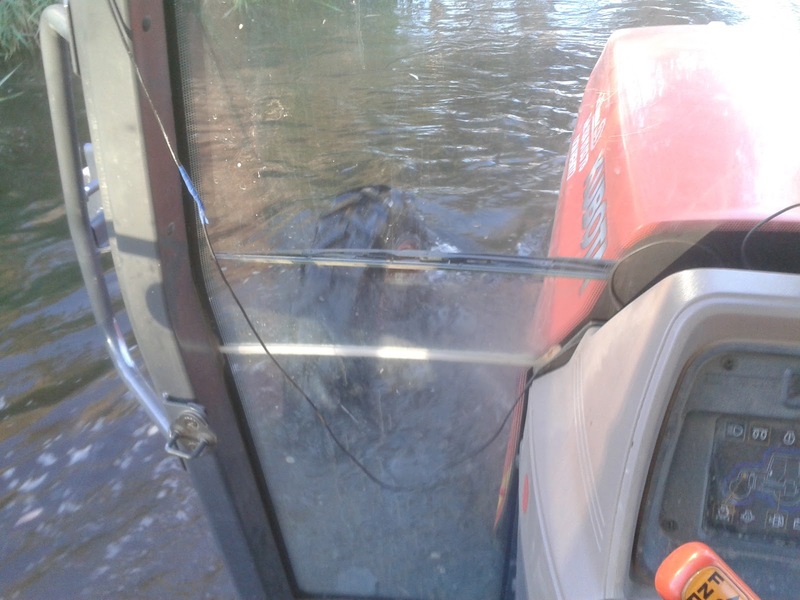 For this task, he used his Kubota M128X, which works really fine in these conditions. 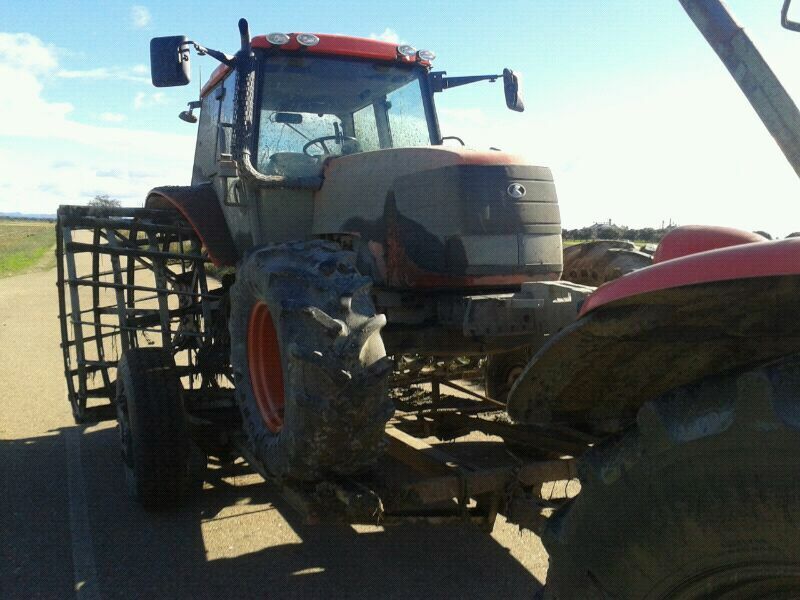 In my opinion, as it is a Japanese tractor, it is more specialized in these tasks, but it is only a personal opinion... what do you think about that? 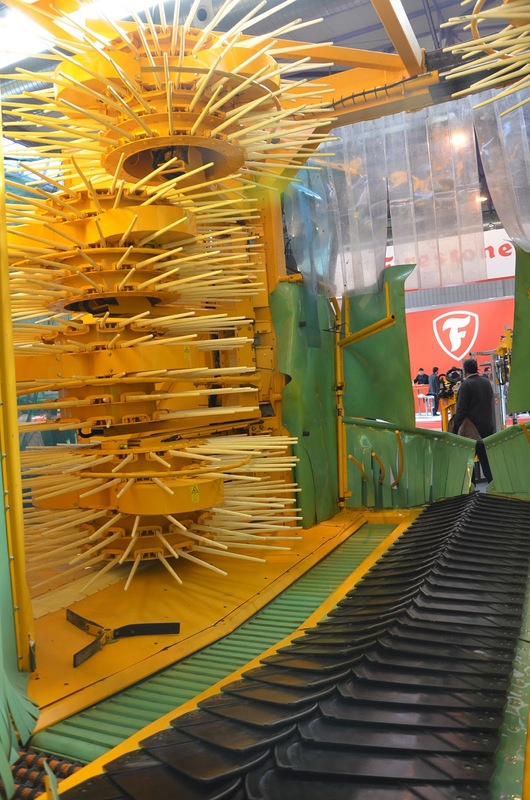 The working speed is approximately 9km/h and the working depth sometimes is large enough. 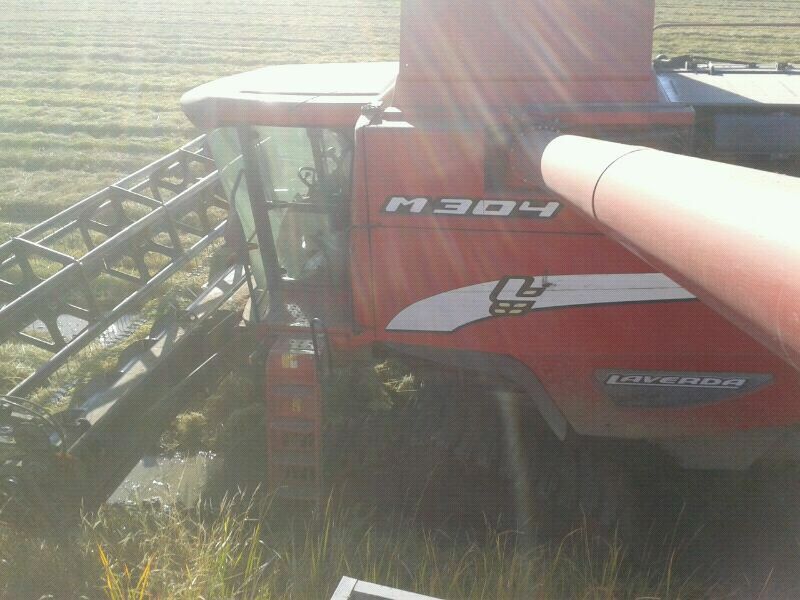 Also, he sent us a few pictures and a video of his Laverda M304 combine harvesting rice, these photos were taken few weeks ago. 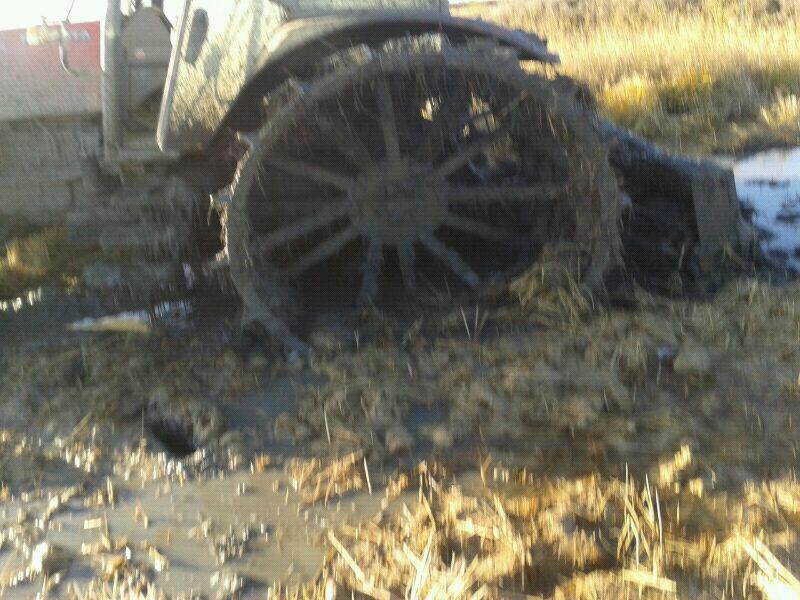 As you can see, the combine needs a special iron tire tread. One more task with clear aim: the seeds will grow sooner and quicker. Just after sowing and before the seeds begin to germinate, we are compacting the soil. 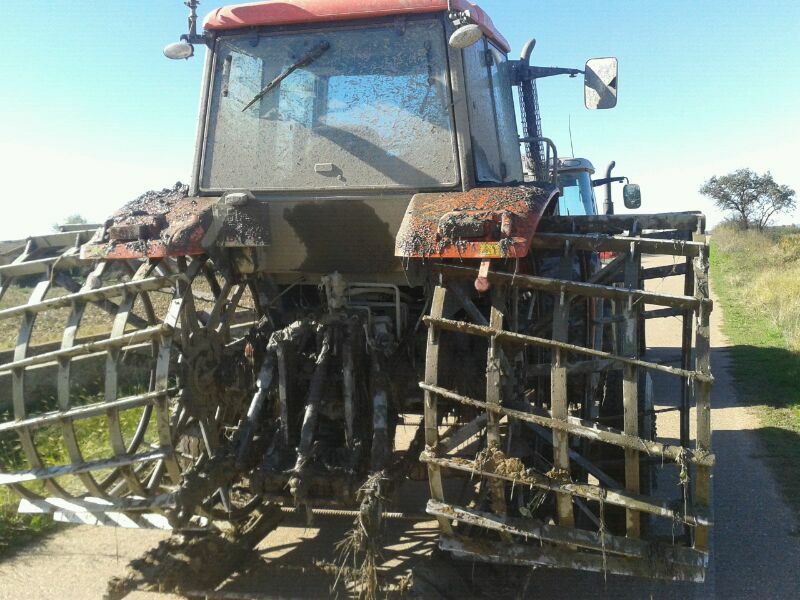 This is possible because soil is not very wet. 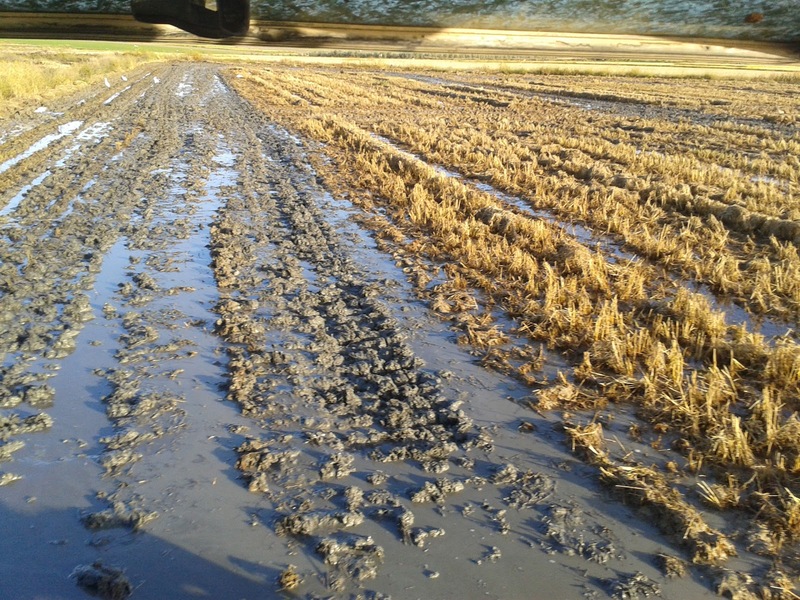 Unless it is possible, we will have to use our flat roller in March when the plants are nearly 5 cm tall and in this case the aim of this task will be different: it will be to put stones under soil to avoid problems with the combine. 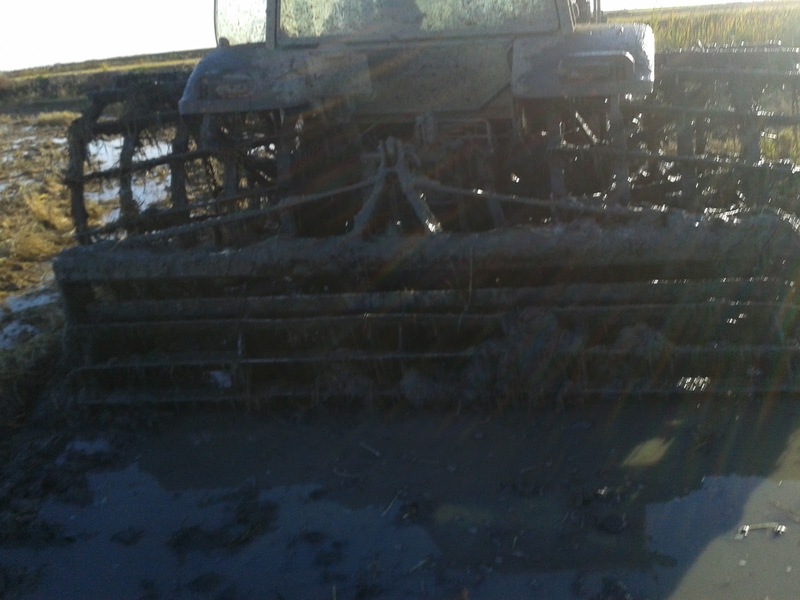 We used a flat roller for this time which was empty (some farmers usually fill it with water) so it was not very heavy... we think it is not appropriate to compact soil too much. On other occasions, we used a disc roller, as you can see in this old post. 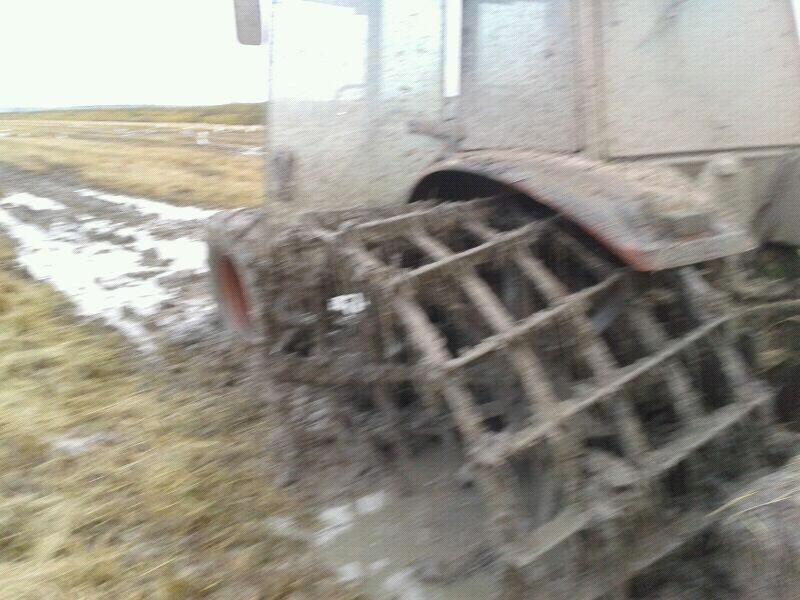 We think for this season disc roller is better but we could not use it. About the job: it is a fast and easy job. 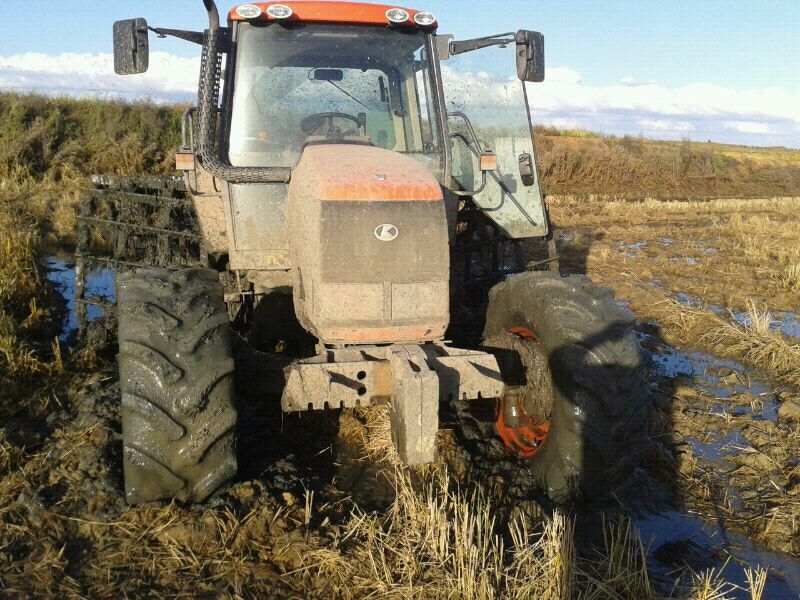 We configured our Agrotron M600 at 1,400 r.p.m. and at 11.2 km/h working speed (we used 3S gear). Last Friday, we visited our friend Juan José de la Fuente. 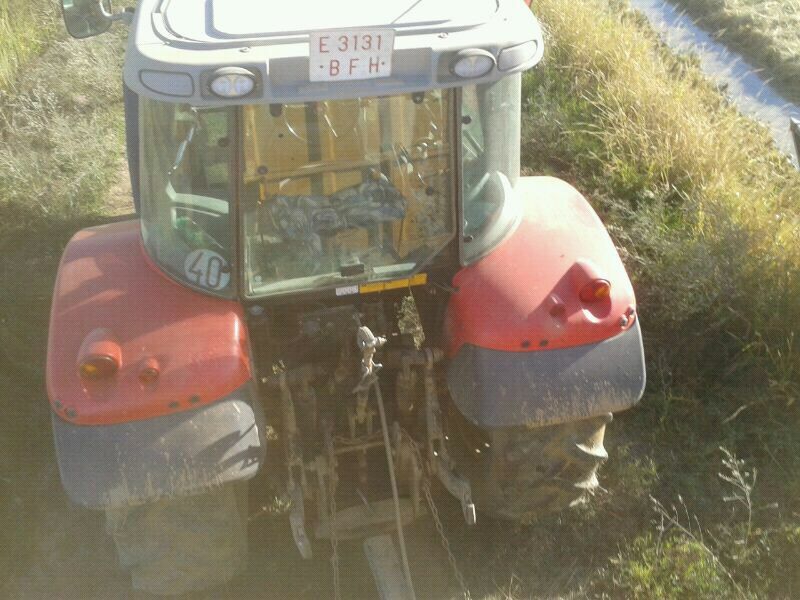 He was harvesting corn in Chinchón (Madrid). 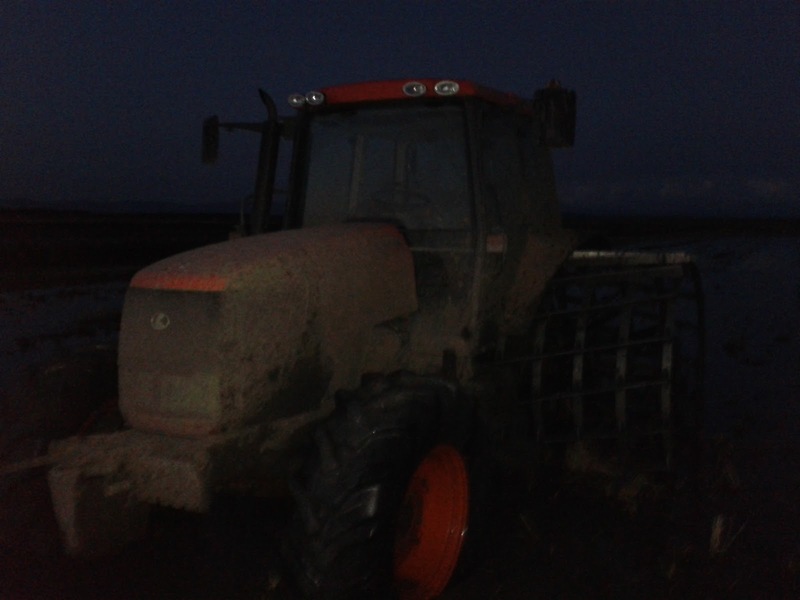 This time, our sister accompanied us and she really enjoyed herself when she went up to the combine with him. That afternoon was very nice because we could talk with a few farmers of that area and they explained us all tasks they have done for the corn. 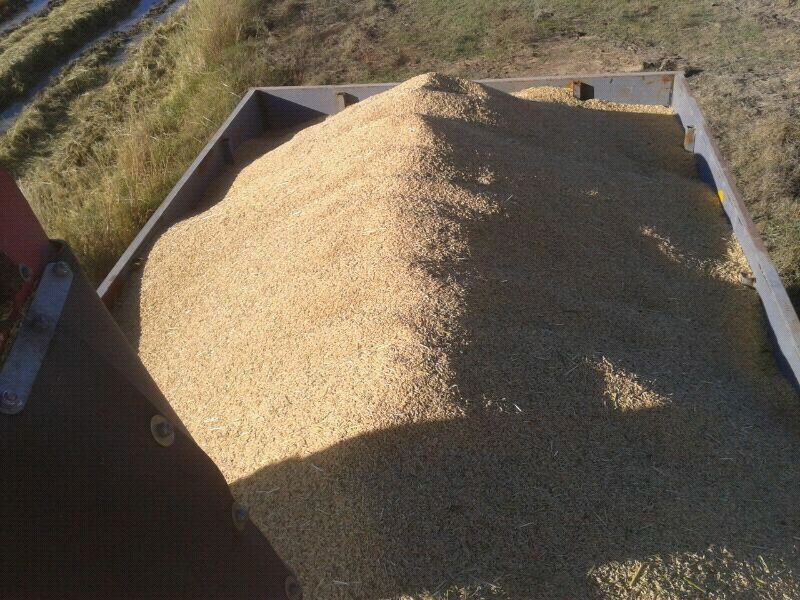 This crop is not usual in our area, so we don't know these tasks properly. 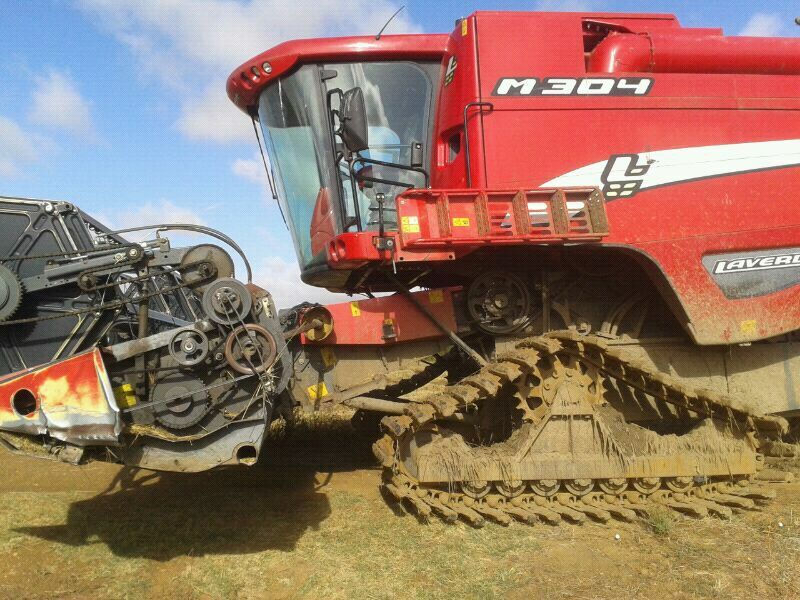 The Claas Lexion 540 combine and Moresil MT 2090 cutterbar work very fine together in the corn and as Juan José told us he can harvest about 200,000 kg in a workday of 10 hours (the performance of this crop is about 15,000 kg/ha and the working speed is of 5.5 km/h). 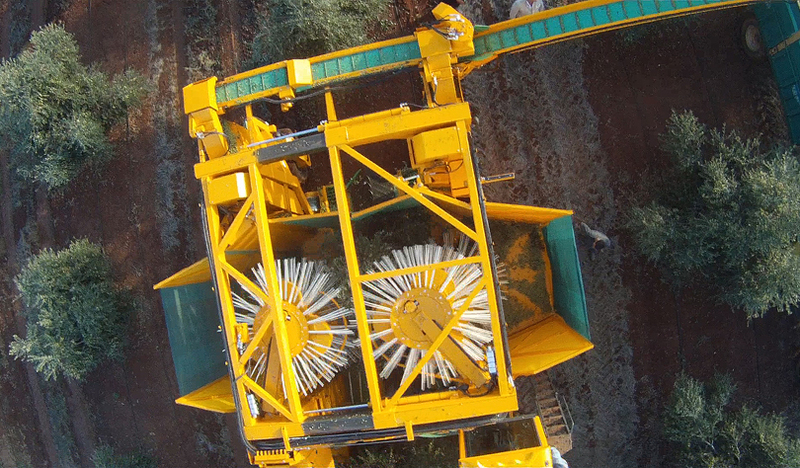 This cutterbar is of 6 rows (working width of 4.5 m) and it includes a stalk chopper per row which crush stems completely... they are like stalk chopper used in cutterbar for sunflowers which you can see in the following video. 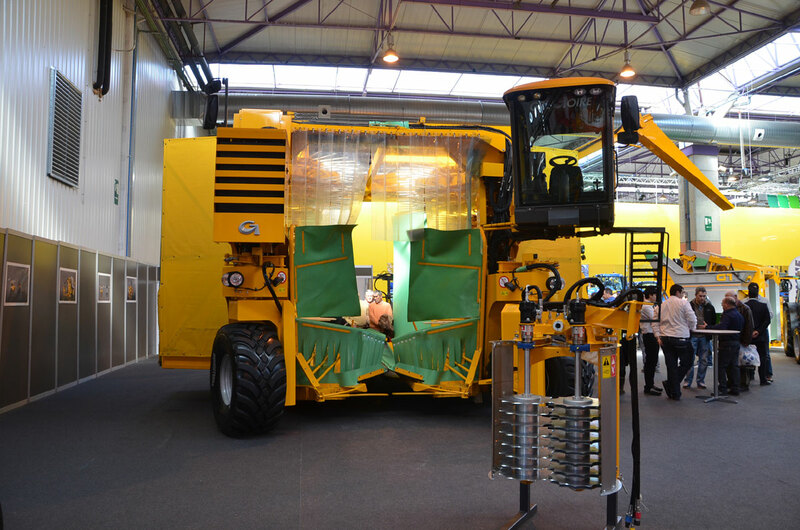 Also, it has a system of harvesting rollers, this system allows the combine only to get corncobs, so the combine doesn't have any problems to thresh them.